· Is the two-state solution still viable? Each panel was composed of women from various countries, reflecting the diversity of the conference participants. An effort was made to have each workshop moderated by one Israeli and one Palestinian woman, though in practice this did not always happen. Political films brought by participants were screened on one conference day in a meeting room. Each day during the workshops, an open microphone session was conducted in the plenary area, where any woman could take the microphone and speak to the issues. 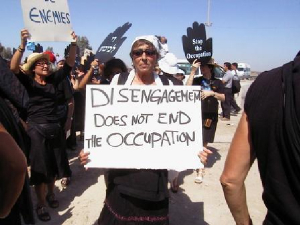 ♦ Women in Black vigil: On Friday afternoon, conference women marched across town dressed in black to attend the Jerusalem vigil of Women in Black (photo), carrying banners in many languages that said “End the Occupation”. Between 500 and 1,000 vigilers, this was a show of strength inside the heart of Jewish Jerusalem. ♦ Action at the Separation Wall: On Monday morning, approximately 400 international women entered Ramallah to express solidarity with the Palestinian women. That afternoon, the entire group, joined by some 100 Palestinian women activists, held a demonstration in Bil’in, where opposition has been fierce to construction of the Separation Wall. There were some verbal exchanges with the soldiers (photo) and, as the women left, tear gas was fired at the Palestinian youths who had joined them. Following the visit to Bil’in, conference participants collected $700 among themselves to buy supplies for the 480 school-children in Bil’in. 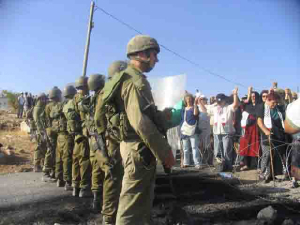 ♦ Action at a Checkpoint: On Tuesday morning, about 500 women formed a human chain across the Kalandia checkpoint, which separates Jerusalem from Ramallah. Some international women joined the Palestinian women on the Ramallah side of the checkpoint, and others joined the Israeli women on the Jerusalem side. For an hour, the women sang songs of peace, and held signs calling for a just peace and an end to the occupation (photo). One Palestinian woman was arrested, but released after negotiations and the threat that the women would not leave until her release. Every evening, multi-cultural events were held in the 3 hotels that had been “taken over” by the conference. Each hotel held events of a different character, and participants walked among the hotels, in close proximity to each other, choosing the events that they preferred – political film, music, dance, political satire, storytelling, etc.